Gutenberg has the primary advantage of being extremely user-friendly, to the point where other novice website developers will find very easy to work with. Instead of using custom codes that most WordPress developers are familiar with, you get the opportunity to use Blocks to edit your content and present them in any way you like. This is not to say that Gutenberg disallows the use of code, but Blocks will help users shorten their time editing their websites’ features by simply arranging elements like what most WordPress page builders do. 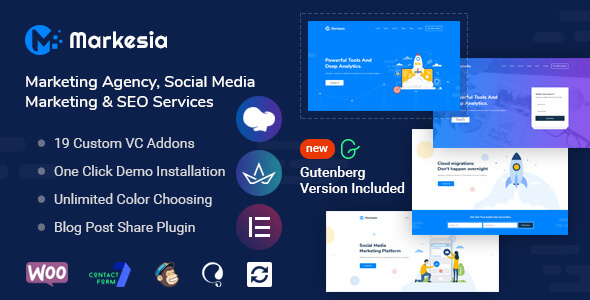 If you are a WordPress theme user, then the Blocks’ system of editing from Gutenberg will definitely be familiar to you, since most plugins like Visual Composer and WP Bakery Page Builder are primarily built to function in the same manner. After all, it would be a shock to you if you have limited knowledge in coding and you would have to face complex codes when finally editing your posts in your website. Thus, some creators have thought that they would like to spare everyone that kind of hassle by making Gutenberg compatible with their WordPress themes. Having Gutenberg compatible WordPress themes should not deter you from creating your dream websites, even if we know that Gutenberg is a relatively new editor. In fact, if you give these themes a try, you will definitely find that as opposed to using other editors, Gutenberg is incredibly fast and gets the job done just how you like it. Gutenberg delivers in fulfilling its promises, which is why some theme creators have given it a try to make it compatible to their themes, in case you want to use it or not. The main advantage of having compatibility to editors and other plugins is that you can get to choose whether or not you want to incorporate the theme or editor to your current theme. It is the reason why some themes seem too bulky and slow, and sometimes even contain unnecessary features. You can still choose to use other editors with these themes, but if you have chosen Gutenberg, you will definitely be happy that it will run smoothly with your current theme. What’s more surprising is that there is already a good number of themes that are compatible with Gutenberg that have a high quality code and various customizability features. Those that fall into these categories are in this list, so it would be a good step to try them out. Deviox has a perfect rating of 5 out of 5 stars because it is a very versatile business theme that can be used for different business companies website development. The theme has some plugins included such as GDPR Framework WP, Slider Revolution, and Swiper Slider. These will allow business websites to comply to the standards of the EU on data protection laws, and also allow you to create beautiful websites using slider plugins. This theme allows you to let your websites become mobile device optimized for the best results in browsing your pages. Not only will your website have fast response when it is being used, it will also display your images and text with great clarity, especially on Retina screens because it is Retina ready. Businesses who wish to add advertisements in their sidebars to generate revenue may add them in at least 7 widget areas that are available to use. Deviox is also made compatible with WPBakery Page Builder. Which allow user to create inner or additional pages by just dragging and dropping. Deviox is based on powerful framework which allow user to the visual and operational sides of your website within minutes. Slider revolution help you to create slider for home page to make it look stunning. 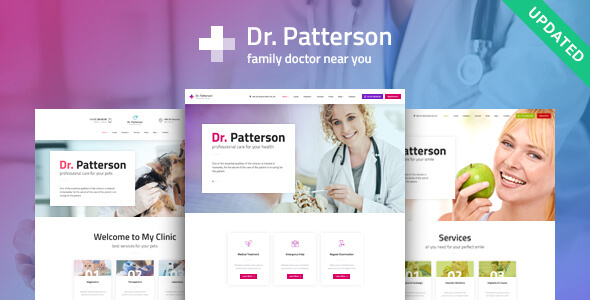 Dr. Patterson is a medicine and healthcare-oriented WordPress theme, which can be used for any medical or healthcare profession that is related to such fields. Some of the plugins that are included in the package are Swiper Slider and Slider Revolution so that you can get professional-looking websites without having to exert much effort. This theme contains short-codes that you may use for any widget or element that you can add to the website pages, and use them for custom post types as well. Awesome Fontello icons are also available for you to use to add to the aesthetic appeal of the website. There are tons of Google Fonts for you to choose from, and you can even use custom fonts if you are not satisfied with what Google Fonts has to offer. You may also add Google Maps to help them look for your location if you accept appointments. 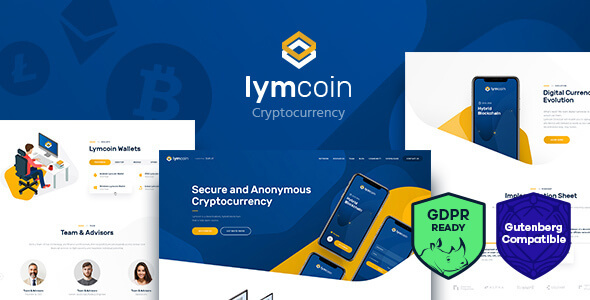 Lymcoin is targeted towards startup cryptocurrency companies who wish to build a website to offer their services to potential customers. Its designs are quite exceptional, which makes it earn a rating of 5 out of 5 stars. The plugins that this theme deems essential to include are GDPR Framework WP, Slider Revolution, and Swiper Slider. Its modern yet trendy design can be modified using drag and drop gestures to customize the website’s pages as easily as possible. Because cryptocurrency is a competitive market, Lymcoin is SEO optimized to ensure that you get the best possible results in getting your target audiences’ attention. Parallex Effect backgrounds are also available for use if you want to impress your visitors. As an added bonus, you may simply contact the creators to get the PSD files that you wish to have in case you want to further customize your website’s elements to your liking. Mae is a highly regarded theme for its beautiful documentation and design quality, thus making it earn 5 out of 5 stars. It is a theme that focuses on events, conferences, and seminars, which means that can be a rather niche theme depending on the subject. The plugin that is included in the theme is Mailchimp, which allows you to send out information to your guests prior to the event. This theme is fully responsive as it uses Boostrap flex grids to also allow compatibility to your websites to mobile devices. You are sure to get fast loading times because it is not loaded with too many plugins that may get in the way of your website’s performance and loading speed. Masonry grids will also allow you to optimize your website’s space to make it look presentable. Google Fonts and Font Awesome Icons are added to tie its overall appeal. Are you looking for flexible portfolio WordPress theme that should be compatible with Gutenberg. 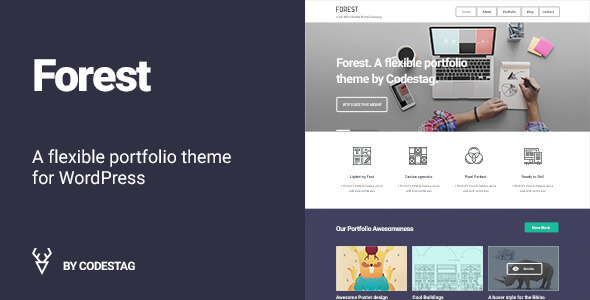 Check out Forest WordPress portfolio theme. It has a rating of 4.35 out of 5 stars because of its great systematic coding though it lacks in some features. This theme is flexible enough even if it is rather simplistic and can be used by anyone, especially those who align with creative professions. 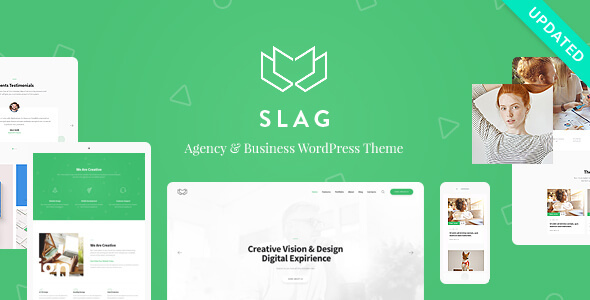 Powered by StagFramework, it also comes with StagShortCode Generator to provide various features that you can use with shortcodes to shorten your time in making your website. There are SEO settings that are built into the theme that will allow you to reach your target audiences more effectively to generate more traffic in your website and get more clients and viewers as a result. If you are tired of the neutral colors that the templates provide, you can simply add color to your accents to add variety in your website without it looking overdone. Google Web Fonts can also be used in this theme. Markesia targets the digital marketing agency and SEO services niche. There are only some theme available that are compatible with multiple page builder and Markesia is one of them. Markesia is compatible with WPBakery Page Builder, KingComposer, and Elementor. Theme are compatible with many premium plugin like WPML, Premium Slider, Contact Form 7, and Silder Revolution to make theme feature ready and user friendly. appear on those devices using WordPress Live Customizer. All the necessary elements are also included in the page layouts such as Services, Case Study, Blogs, and many more. Theme have various home page layout option that you can choose and select for your live website within couple of clicks. Are you looking for WordPress theme that help you to create website for Internet, Broadband & Telecom companies website? MaxiNet has a perfect. 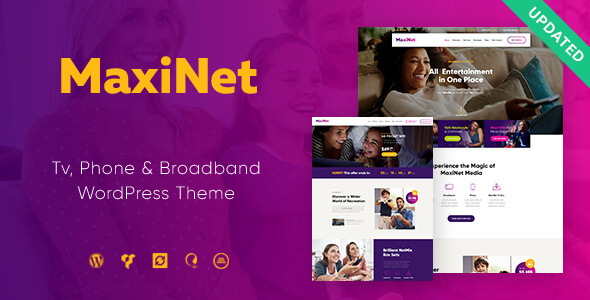 MaxiNext is popular because of its exemplary designs and the overall quality of the theme. This theme caters the broadband and telecom industry related businesses who wish to create their own website. In order to adhere to EU laws, this theme has included GDPR Framework WP plugin. There are addons from the ThemeRex plugin that you may use to improve your website if you wish to apply them. Essential custom post layouts that you will definitely find useful are the Services panels, Team page, and Testimonials panels to attract potential customers. You can also quickly change the color scheme of the website, whether it be applied to all elements or only a select few pages or panels. MaxiNet also offers a a free WooCommerce plugin, which you will find useful when your customers wish to subscribe to any of your featured services online. Jacqueline is targeted to spa and massage salon establishments who wish to make themselves known through the internet. Users find that it has a great quality to its design and vast customizability, thus getting a rate of 4.77 out of 5 stars. It includes Swiper Slider, Slider Revolution, and WooCommerce to help you create a stable website that can accept online transactions with great security. Its modern and chic design will definitely attract your intended audience, and you can even change the color scheme to match your business’ aesthetics. Sticky Menus will help you with your customers’ navigation as they will be able to see all the information they will need without having to lose them as they scroll. Its admin interface will let you control every aspect of your website’s pages especially if you wish to override some controls and features of some elements to make them more interactive. The theme that is perfect to create personal website for massage therapist, chiropractic, orthopedic masseur doctor and skin expert and any more businesses. 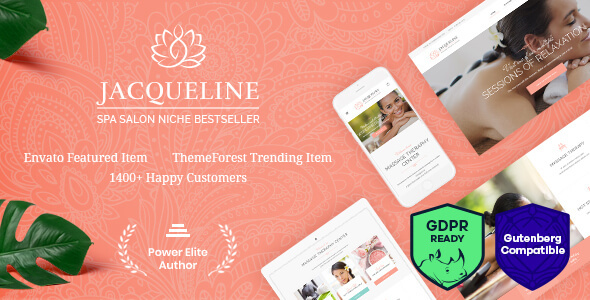 Jacqueline is most popular and top selling spa massage WordPress theme. 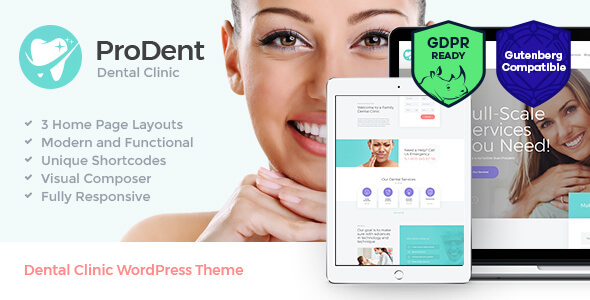 ProDent mainly features elements that are catered to dental clinics and healthcare industries who wish to make their own professional website. It has a rating of 4.90 out of 5 stars because of the many useful features that are readily available to customize to their liking. You will no longer need any coding knowledge because of its drag and drop feature that is complemented with Slider Revolution to create a fully responsive website. The most unique aspect of ProDent is that it offers mutli-layout pages that you can readily use to fill with content that is related to your dental services. You can still upgrade these features or remove certain unwanted elements by using short-codes to customize them. Mega Menus can be used in this theme to allow your audiences to navigate to certain parts of the website with great ease without scrolling all the way to the bottom panel. You may think that there are only certain niche businesses that Gutenberg compatible WordPress themes cater to. Because many creators have seen the potential of this editor, they have also managed to integrate it into other businesses and use it just like any kind of editor that people commonly use today. This list does not cover all kinds of websites available in the internet, but you can still try them out if any of them interest you.